Let's say you are a passenger in your friend's car. You're having a good time when all the sudden you see police lights behind you. The car gets pulled over, and after sensing nervousness emanating from your friend the police decide to search the vehicle without a warrant. A bag of marijuana is found under the driver's seat, and you are taken into police custody for joint possession of a controlled substance. But this pot isn't yours, so how is this a fair arrest? The answer is that it isn't fair. There has to be substantial evidence linking the defendant to the drugs if possession is to be proved. The state must prove three elements of constructive possession in order to convict. First, it must be a controlled substance. Second, the defendant must be proved to have possession. Third, the defendant must knowingly and intentionally possess the substance. A defendant's mere presence at a location where illicit drugs are discovered does not permit an inference that he knew of and had control over the drugs so as to be guilty of possession. State v. Brown, 80 N.J. 587, 593, 404 A.2d 1111 (1979). The defendant must know the location and character of the drugs involved in order to have possession. Since you did not know the marijuana was under the seat, you did not have any sort of possession over it. Also, what about the search? Is the nervousness of the driver enough to prove criminal activity and warrant a search? The answer is no. 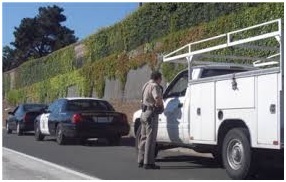 In order for an officer of the law to be able to search a vehicle without a warrant, two requirements must be met. First, there exists probable cause that there are illicit substances in the vehicle and second, exigent circumstances must exist which do not give the officer enough time to get a search warrant. According to State v. Carty, a State trooper's observation that driver and passenger "appeared to be nervous" did not provide reasonable articulable suspicion of criminal activity, as basis for asking for consent to search the vehicle and its occupants during or after valid traffic stop. N.J.S.A. Const. Art. 1, par. 7. Therefore, an officer must have some other valid suspicion of criminal behavior before he can prove probable cause. If faced with this issue please contact a NJ criminal attorney at LS&P Lawyers for a free consultation. We are available 24/7 and have offices conveniently placed in New Jersey.